Describe a pressure reducing valve using the 5 main characteristics used to classify pressure control valves. 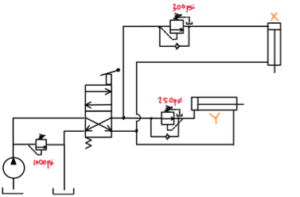 Describe the basic operation of a pressure reducing valve. Differentiate between constant pressure type pressure reducing valves and constant reduction type pressure reducing valves. Describe operation of this multi actuator hydraulic circuit making use of a pressure reducing valve. 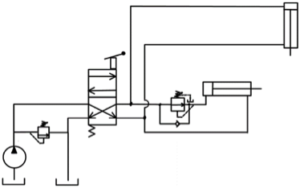 Describe operation of this multi actuator hydraulic circuit making use of both a pressure reducing valve and a sequence valve. Discuss how set values of the pressure reducing valve, sequence valve, and main pressure relief valve influence the proper functionality of the above system.